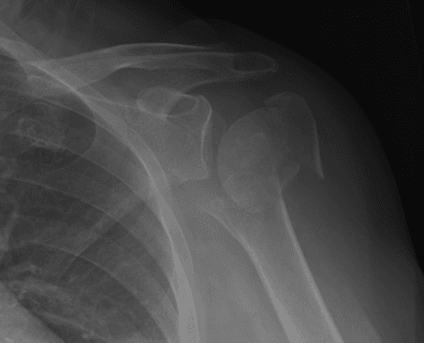 Home How Should Surgeons Manage Proximal Humerus Fractures? Dr. Michael McKee answers questions from ICJR about the options for surgical treatment of these fractures in older patients. ICJR: Which older patients benefit from surgery – such as ORIF, hemiarthroplasty, or reverse total shoulder arthroplasty – versus non-operative management for a proximal humerus fracture? Michael D. McKee, MD, FRCSC: Fractures of the proximal humerus are common, especially in older individuals. Surgical indications are clear in younger, active patients with good bone quality. However, indications for older patients, especially those with osteoporosis or medical co-morbidities, remain highly controversial. One of the few studies comparing conventional proximal humeral (non-locking) plates to PHLPs showed a 47% increase in early re-operation rates in PHLP-treated patients. This large population-based study revealed wide variations in the rate of surgical intervention for proximal humeral fractures in one state (from 0% to 68%), emphasizing the uncertainty regarding surgical intervention for this fracture. 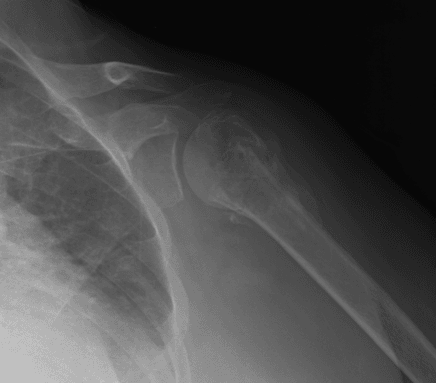 Thus, at present, with the techniques and implants available, a non-operative approach to most proximal humeral fractures in older patients is recommended. A recent population-based study from the province of Ontario, Canada, revealed that from 2007 to 2012, 24,462 of 32,750 proximal humeral fractures in older patients were treated non-operatively or with a closed reduction alone, 2,979 had open reduction and internal fixation, and 1,419 received an arthroplasty. Many patients treated non-operatively did well clinically despite significant radiographic abnormalities (Figure 1a-b). Figure 1a. 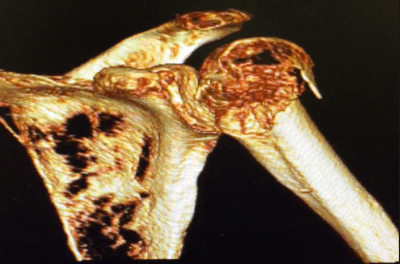 Antero-posterior (AP) view of the left shoulder of a 78-year-old retired female with a number of chronic medical co-morbidities, demonstrating a 3-part proximal humeral fracture with displacement. Figure 1b. AP radiograph taken 10 weeks post-injury following sling treatment. The fracture has healed and the patient was in minimal pain. She had good function, with 130° of active forward flexion. Obviously, this last indication is the most controversial, and remains to be clearly defined. At present, it would be reasonable to state that surgery is indicated if the expected function that would result from non-operative treatment would not be acceptable given the patient’s age and expected activity level (Figure 2a-c). Figure 2a. Radiographs of an older patient who sustained a proximal humerus fracture secondary to fall from a bicycle. Photo courtesy of Foundation for Orthopaedic Research & Education. Figure 2b. A 3D CT reconstruction of the patient’s injury. Photo courtesy of Foundation for Orthopaedic Research & Education. Figure 2c. 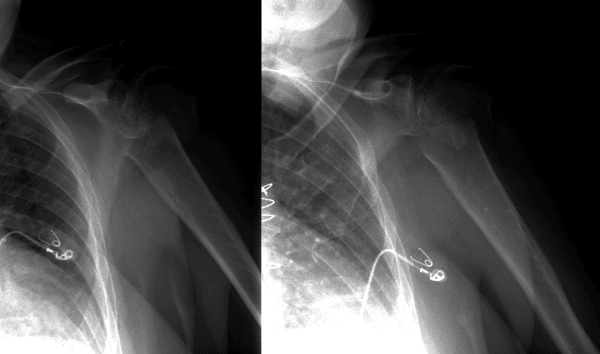 Postoperative radiographs illustrating use of reverse shoulder arthroplasty for the management of proximal humerus fractures. Photo courtesy of Foundation for Orthopaedic Research & Education. ICJR: What surgical pearls do you have for optimizing outcomes with these surgical procedures? Dr. McKee: The optimal intervention for displaced proximal humeral fractures depends on a number of factors including the viability of the head fragment, the ability to reconstruct the tuberosities (and the integrity of the rotator cuff), and the healing potential of the patient. Arthroplasty, either hemiarthroplasty or reverse total shoulder arthroplasty, is preferred when the humeral head fragment is not expected to be viable. Additionally, newer techniques – such as the routine use of calcium phosphate cement or intramedullary fibular strut allografts – have shown early promise but remain to be verified through large prospective or comparative studies. Hemiarthroplasty has been the traditional option for patients in whom the humeral head is not amenable to fixation; however, clinical outcomes following hemiarthroplasty depend on tuberosity healing, which can be unpredictable despite excellent surgical technique. The clinical results of reverse total shoulder arthroplasty are not as dependent on tuberosity healing , although reverse total shoulder arthroplasty outcomes with healed tuberosities are superior to outcome with non-healed/deficient tuberosities. Practically, there has been a dramatic increase in the use of reverse total shoulder arthroplasty in managing proximal humeral fractures. A prudent option for surgeons unfamiliar or uncomfortable with reverse total shoulder arthroplasty would be to proceed with hemiarthroplasty but to use a “platform” stem (carefully inserted at the correct height and version) so that in the event of tuberosity/cuff failure, conversion to an reverse total shoulder arthroplasty can be accomplished. 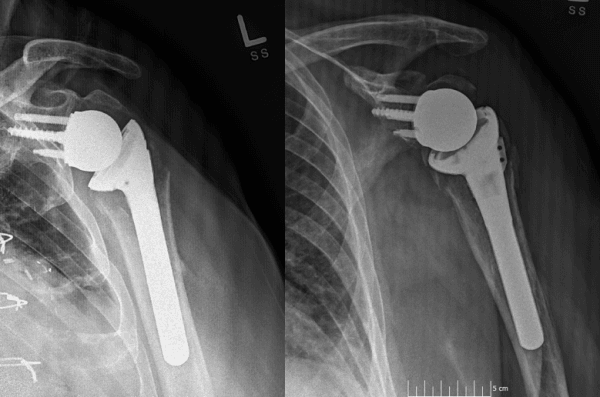 Conversion from hemiarthroplasty to reverse total shoulder arthroplasty in a patient with a platform stem is quicker and results in less blood loss and a lower complication rate because the stem does not have to be removed. Hopefully, the future will bring larger, high-quality RCTs and prospective studies that will aid the practicing orthopaedic surgeon in decision-making with respect to these common and difficult-to-treat fractures. Owsley KC, Gorczyca JT. Fracture displacement and screw cutout after open reduction and locked plate fixation of proximal humeral fractures [corrected]. J Bone Joint Surg Am. 2008 Feb;90(2):233-40. Implications: The authors were surprised by the high rate of screw cutout and revision surgery associated with the use of locking plates to manage proximal humerus fractures. This was especially true in older patients (over age 60) with 3- and 4-part fractures. They advocate continued evaluation of ORIF in this patient population. Implications: Using a 20% sample of Medicare Part-B data and the Medicare denominator file, the authors evaluated surgical management of proximal humerus fractures from 1998 to 2006. Although the rate of surgery increased signficiantly in the later years, the authors found inconsistencies across regions of the US, with the percentage of patient with proximal humerus fractures who underwent surgery ranging from 0% to 68%. This result demonstrates the lack of consensus on the management of these fractures. Rangan A, Handoll H, Brealey S, et al. Surgical vs nonsurgical treatment of adults with displaced fractures of the proximal humerus: the PROFHER randomized clinical trial. JAMA. 2015 Mar 10;313(10):1037-47. doi: 10.1001/jama.2015.1629. Implications: In 2 years of follow-up, no significant differences were seen in patient-reported outcomes between surgical and non-surgical management of displaced proximal humeral fractures of the surgical neck. This finding calls into question the rise in surgical procedures to manage these fractures. Implications: This study suggests that the use of a locking plate may confer functional outcome and health-related quality of life advantages when compared with non-surgical management of older patients with a 3-part displaced fracture of the proximal humerus. Unfortuately, these advantages were minimal, and there was also a significant risk of reoperation in the locking plate patients. Fjalestad T, Strømsøe K, Blücher J, Tennøe B. Fractures in the proximal humerus: functional outcome and evaluation of 70 patients treated in hospital. Arch Orthop Trauma Surg. 2005 Jun;125(5):310-6. Epub 2005 Apr 21. Implications: Non-operative treatment produced better outcomes than surgical management in patients with complex, displaced, non-impacted proximal humerus fractures (B2, B3, C2, and C3 in the AO classification system). Of note, this was a small study, with only 20 patients in the complex fracture group. Implications: Patients with proximal humerus fractures who underwent reverse total shoulder arthroplasty had better outcomes (pain, function, revision rate) than patients who underwent hemiarthroplasty. Revision to a reverse procedure from a hemiarthroplasty did not, unfortunately, improve outcomes in this small study. Michael D. McKee, MD, FRCSC is Professor of Orthopedic Surgery in the Division of Orthopaedics, Department of Surgery, at St. Michael’s Hospital and the University of Toronto, Toronto in Canada. Dr. McKee has disclosed that he is a consultant for Stryker, Zimmer, ITS, and Acumed and that he receives publishing royalties from Wolters-Klower, Elsevier, and Lippincott. Next articleICJR ROUND TABLE: Should a Study on the Effectiveness of TKA Change Practice?